You might celebrate a video game for its gameplay, graphics, or its story, but let’s briefly celebrate the excellent little things Batman: Arkham Knight does to respect the time of its players. Oh, if only more modern games did these things. These ideas aren’t all brand-new, but they’ve been implemented in Arkham Knight with a slickness that’s rare even in big-budget games. Think of this stuff as quality-of-life improvements or, simply, of a big-budget game exhibiting the kind of user interface and user-friendliness that a multi-million-dollar production should always have. What we have here are two back-up saves, tidily hidden until a button is pressed. We can roll back our progress to either one and resume playing from there. Is this a safeguard against glitchy saves? Maybe. More likely, though, it’s a slick, smart way to give players a rolling selection of three saves to choose from without cluttering up a menu. Good save management and clean menus. A rare gift to gamers! Some of us play video games while we are tired, drunk or high (not casting judgments!). Some take long breaks of days or weeks between sessions. Life can get in the way. And then we return to the game and wonder: what the hell was I doing? Batman Arkham Knight, like many games, wedges some story recaps into its loading screens, but it also presents an expanding recap slideshow in its Extras menu. Did you already forget why you went to Ace Chemicals early in the game? Check the story synopsis! Helpful. Just please no one tell me what happens in slide 56. 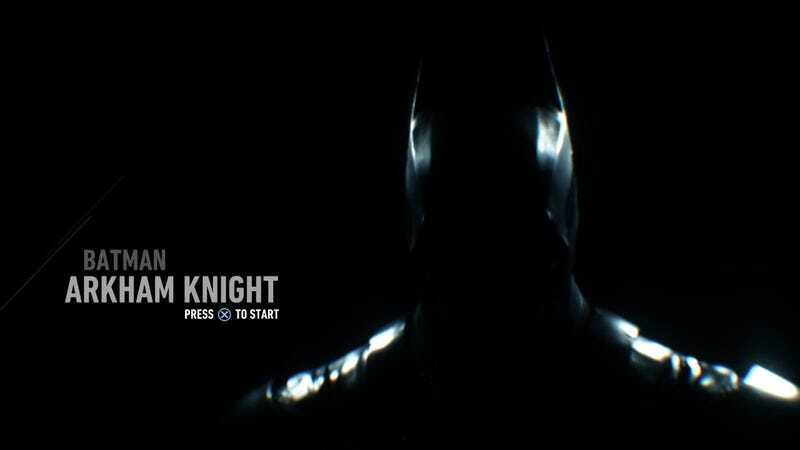 Arkham Knight has dozens of quests and sidequests and stars a hero who uses a plethora of gadgets. It is set in a large open world that has things to do from high among its rooftops down to its streets. It could have been an overwhelmingly confusing game. It’s not, thanks to smart menu design and clever use of voicework. The game’s user interface presents most of the information that you’d wind to access while swooping/driving/punching through Gotham City with radial menus for weapon and mission selection. These are all activated with a push on a controller’s d-pad and then navigated with a swivel of an analog stick. Releasing the d-pad button locks in the selection. The menus are easy to read, snappy and labelled with helpful information—namely whether a given questline is accessible and how close the player is to the starting point of the next mission in that quest. What if you can’t remember what a given quest line is about? What if you’ve been so busy chasing Riddler trophies you forgot what is happening in the game’s main quest or just can’t recall where the serial killer subplot left off? Lucky you, our hero (Batman!) and/or his butler will mutter a little something about whatever questline you select. They’ll even have something to say if you can’t currently proceed in the quest or if the game designers want you to find the next activation point for that quest by exploring the game’s big world. In those cases, they’ll just remind you what the general idea of that quest is about. Even the biggest and “best” video games are filled with clunky menus or don’t seem designed to fit into our busy modern lives. This game bucks those trends smoothly and smartly. None of these small touches will win Arkham Knight any awards. They should still be celebrated.